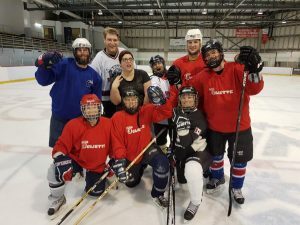 Hockey is Canada’s winter sport and it goes without saying that the ice hockey tournament at the 2018 Canada Deaf Games will be popular. 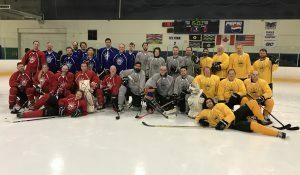 In addition to Jim Kyte — the only Deaf player to have played in the NHL and his family’s participation, the hockey games will be spectacular with the new 3 on 3 format. It will be a first in the Canadian Deaf Sports Association (CDSA) history to present a 3 on 3 ice hockey tournament without contact. The style of play will be different given the size of the rink is adjusted for a total of five players per team. “We will have to use strategies and different game plans with this new formula, however I am certain that games will be very interesting as much for us as for the fans,” said Francois Guévremont, one of Team Quebec players. Guévremont and David McGregor from the British Columbia Deaf Sports Federation (BCDSF) suggested to CDSA and the Games Organizing Committee to use the 3 on 3 format and forbid contact. “We shared that while competitive 5 on 5 hockey with contact is important for international competitions, we believe that the sport needs to be celebrated across all skill levels, ages and genders. This is why we thought a change in the formula would shake up the sport,” said McGregor, BCDSF’s Sports Access Coordinator. This also gives the opportunity for women to participate in the Games as there were not enough players to make up women’s teams. Team Quebec and Team Kyte will have a mixed lineup. Guévremont and his sister Chantal will be able to play together. Team Quebec and both teams from BC have planned a few practice sessions before the Games, in order to get used to the new format. Before the spring 2017 McGregor noticed a decrease in participation and activity of the BC Rockies Deaf Hockey program. He met with the Hockey Commissioner Patrick Escalambre and General Manager Shawn Mayzes to brainstorm ideas on how to increase the level of participation. The 3 on 3 Annual Showdown was born. Four teams with a total of 31 Deaf and hard of hearing players of all ages, skills and genders took part in the tournament in March 2017. “We want to collaborate and share with other provinces on how we have been able to improve our hockey program and increase our numbers,” said McGregor. His goal is to strengthen hockey across the country in collaboration with athletes, Provincial Deaf Sports Associations and CDSA, so that the sport flourishes. In the meantime, McGregor and both BC teams look forward to play at the Games. “I am very excited to play in Winnipeg and also to play against the other BC team, because a friendly rivalry developed between both teams. We will play against them on the first day of the ice hockey tournament,” said McGregor. The ice hockey tournament begins on Feb. 22 and will run until Feb. 24. Consult the hockey games schedule.